Summer is almost here and cold desserts are really desirable right now. 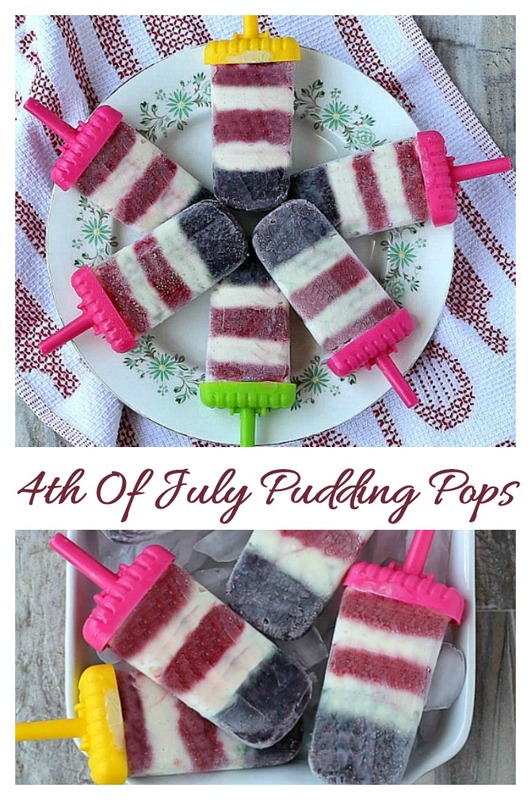 These layered pudding pops with their red, white and blueberry stripes are perfect for a 4th of July or Memorial Day barbecue party. I enjoy making pudding pops instead of juice pops. The texture comes out more like a creamsicle than a Popsicle and I find them a more pleasant feel in the mouth when I am eating them. I always wonder about popular trends in foods. (One of my favorite Cooking Channel shows is “Food, Fact or Fiction“.) My research shows me that Pudding Pops have an interesting history! The treats were first marketed by Jell-O and Bill Cosby was their spokesperson. He called them “Puddin’ Pops.” They were first sold in the 1970s but later discontinued because they weren’t profitable enough. Grocery stores later started selling them again under the Popsicle brand name but their texture and shape was different, so they never really took off. Once again, in 2011, they were discontinued. So, if we want to have these treats in our home, it’s up to use to make them now! Generally speaking, making pudding pops is just a matter of whipping up some instant pudding and freezing it to enjoy later as a sweet treat, but for today’s fun frozen dessert, I want to make layers in my pops for a patriotic look to the treat. This takes a bit longer than normal but the look is so worth it. 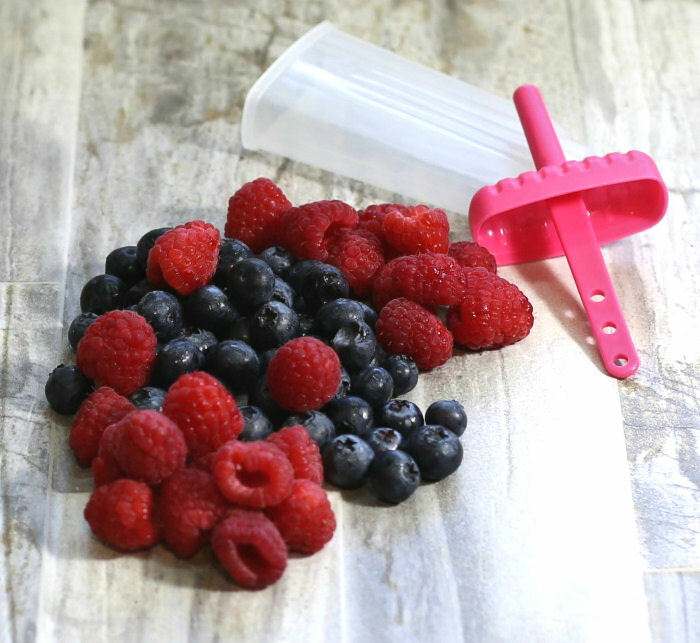 To get bright vibrant colors without the need for food coloring, we’ll be using fresh raspberries and blueberries. We want to end up with the look of the flag when done and the colors are perfect for this. Note on the blueberries: Depending on how ripe yours are and the color of them to start, you may want to use a few drops of blue food gel coloring. The blueberries have a tendency to turn purple in the food processor. I used a white chocolate fat free, sugar free pudding mix and skim milk to keep the calories light for this sweet treat. Thin out the pudding to get a very soft consistency to make it easy to make even layers. Use a food processor or blender to puree both batches of fruit. Be sure to add just a bit of milk to the fruit as you pureé it to give the finished fruit a less thick consistency. Transfer the pudding and each of fruit pureé mixtures to their own icing bag and keep cold. Icing bags make it really easy to make the layers without making a mess of the molds and the popsicles. I find it much easier than trying to pour the mixtures into the molds. Start by pouring a thicklayer of the blueberry pureé into the bottom of each mold. It needs to be wider than the other layers to give the pudding pops a “flag” look when they are done. The fruit pureé will likely have some pulp in them if you use a food processor, so you’ll need to snip off a good sized end hole for the mixture to come out easily. I used normal Popsicle molds that have tops with the stick insert built into them and I put mine pops in the freezer for about 20 minutes before continuing with the other layers. Alternate slimmer white and red layers to make the stripes of the flag until you get to the top of the mold. The stripes don’t need to be perfect. A rustic striped look is fine. Add the Popsicle tops and freeze until the pudding pops are firm. These red white and blueberry pops have a creamy taste with a tart fruit finish that is delightful. The striped layers will put your Independence Day party guests in a Patriotic mood for sure! They are fresh and bright and the perfect way to cool down on a hot summer day. This recipe makes 12 layered pudding pops, each with approximately 68 calories. They are a perfect treat for those watching their weight! I have a whole post written on tips for making popsicles, and pudding pops use some of the same techniques. 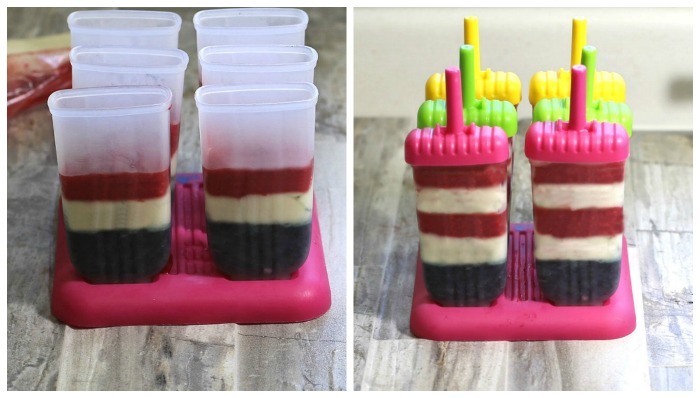 If you are making layered popsicles, get ALL of your ingredients ready before hand and set up the molds. Instant pudding sets quickly so you will want to be ready with it. Keep a folded paper towel handy to use to tidy up the insides of the molds in case you make mistakes. Be sure to thin both the puree and the pudding. It will help you to get even layers when you pipe in the mixture. For the most even stripes, it helps if all your ingredients and molds are very cold before you start the layers. Freezing between each layer will also help to get even stripes, but this will take longer to do, of course. I used a traditional Popsicle mold, but any frozen dessert mold will do. A mold which has a see though outside will make it easy to check your progress on the layers. Leave a bit of extra room on top of the mixture so that it will not overflow when the pudding mix freezes and expands. 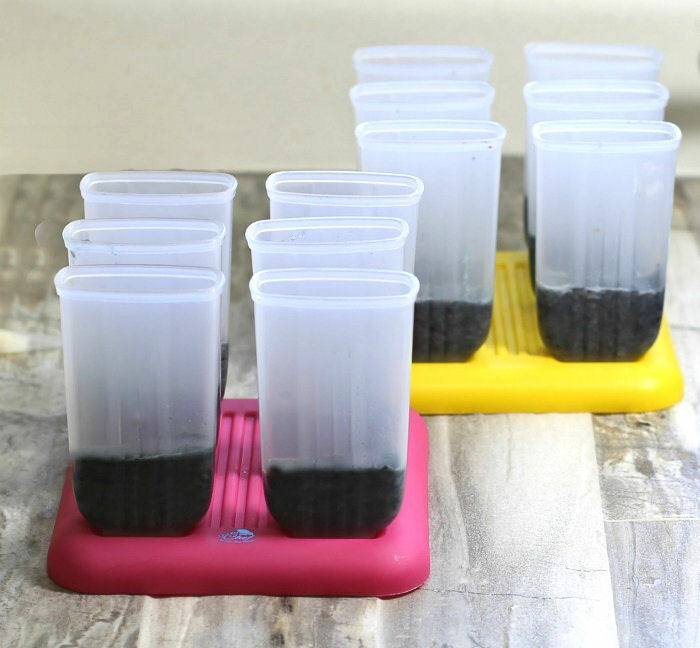 Un-mold your individual pops by either running the outside of the mold under hot water, To un-mold the whole unit, fill a pan that is at least as tall as your mold with warm water. Don’t use hot water for this method or you might start melting the pops. Dip the mold into the water for about 20-30 seconds until it loosens the pops. 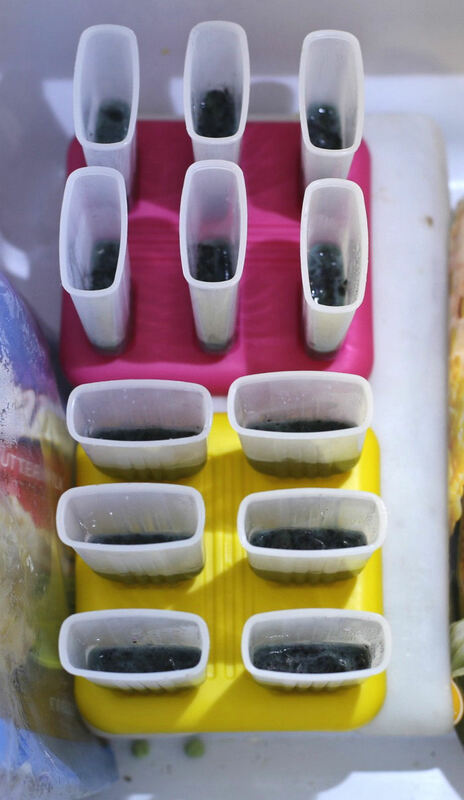 Once un-molded, you can eat them right away, or wrap the pops in ziplock bags and store them in airtight containers and freeze them again, so that you have the molds ready for another recipe. The second freeze also helps them to keep their shape a bit better so they won’t melt too quickly as you eat them. Well wrapped pudding pops will keep for 3-4 weeks in the freezer before losing their flavor. To remind you of the recipe for easy access later, pin this image to one of your food boards on Pinterest. 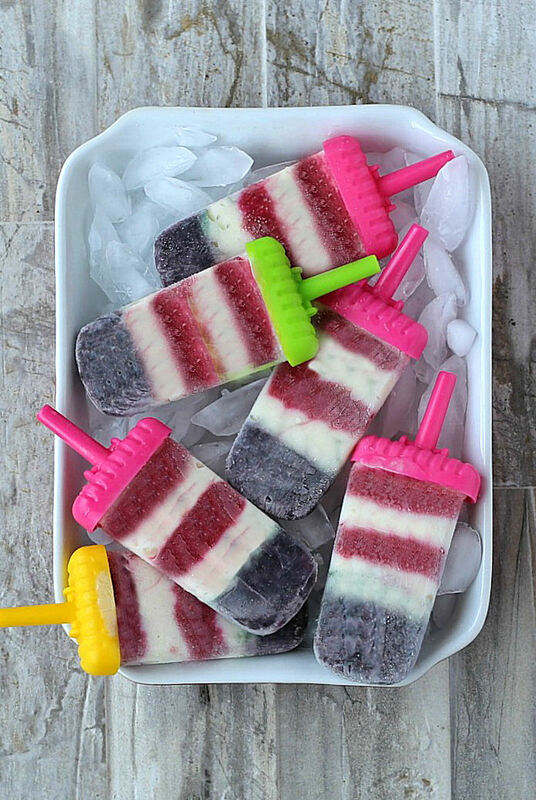 These layered pudding pops have red white and blue stripes to give them a patriotic look. These are fresh, creamy and tart and taste really great. 4 cups skim milk plus extra milk to thin the pudding and fruit purees a bit. Using a food processor, or blender, puree the raspberries until smooth and set them aside. Rinse out the food processor and do the same with the blueberries. 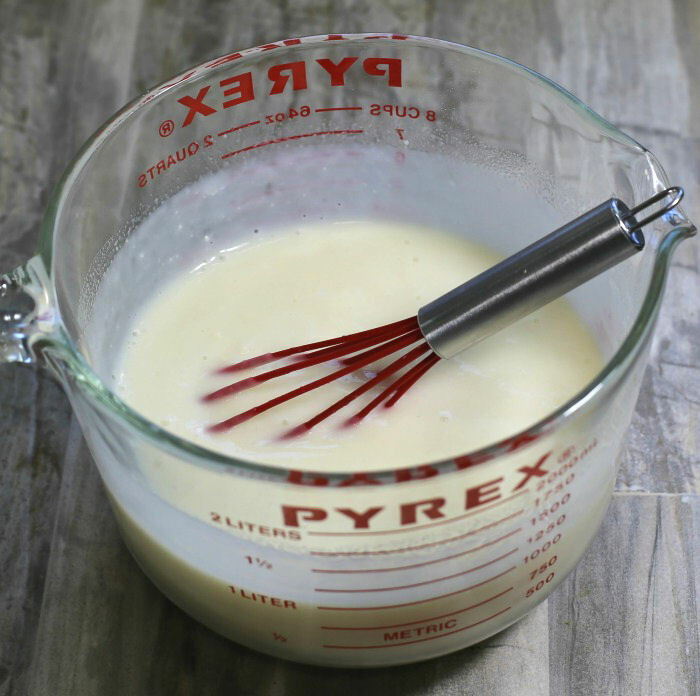 Add a bit of extra skim milk to each of the purees and to the pudding so that they will be a fairly thin consistency. This helps to make even stripes. 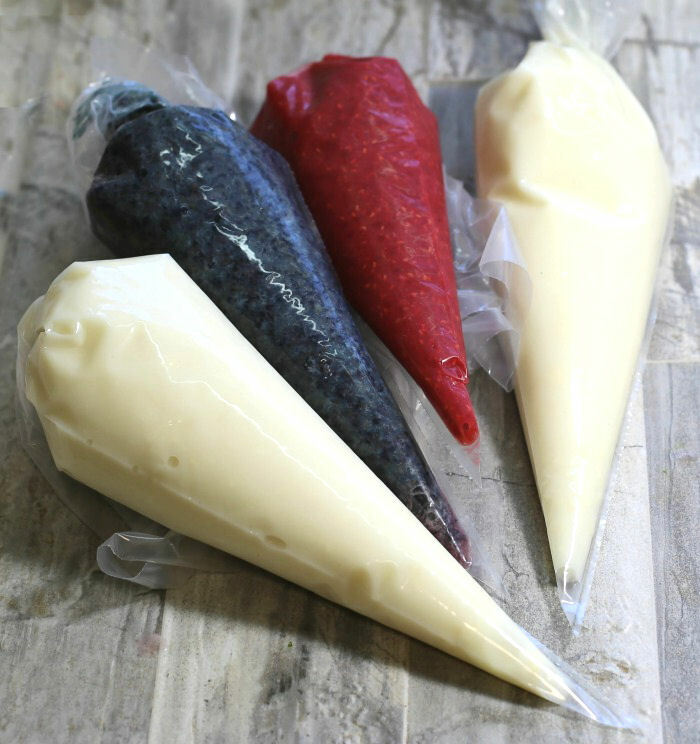 Put the pudding mix and each of the berry purees 3 icing bags to make it easy to pour into the molds. Freezing between each layer takes extra time but gives a more tidy look. 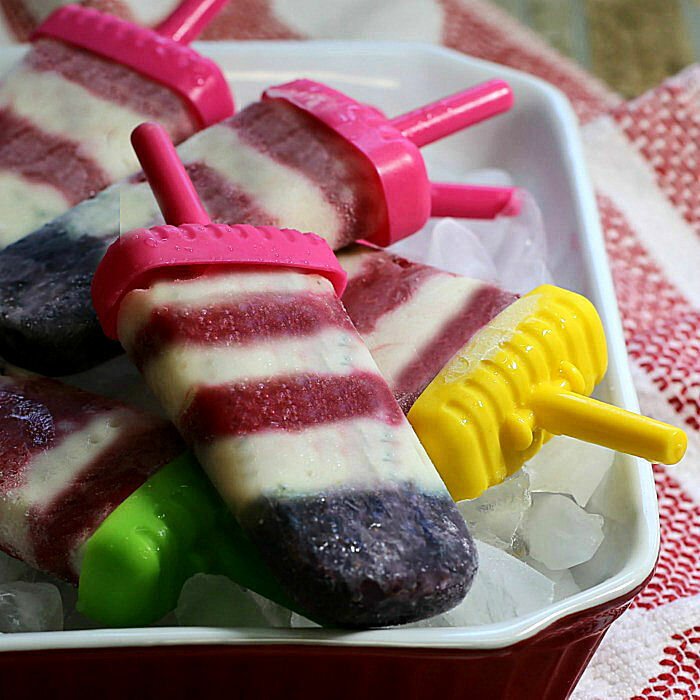 To layer the pudding pops, start by pouring a thick layer of the blueberry puree in the bottom of each Popsicle mold. Freeze for about 20 minutes to allow this layer to set. Continue adding layers, alternating between white and red layers. Add the tops and sticks to the molds and place in the freezer and freeze till firm. Don't worry if the stripes are a bit uneven. A rustic look is fine. Once frozen, un-mold your pops by running the outside of the mold under hot water.. Note: Thining out both the fruit mixture and the pudding will help you to get even layers for your pops. It is very hard to do this if your mixtures are too thick. They will freeze later even if thinned out.